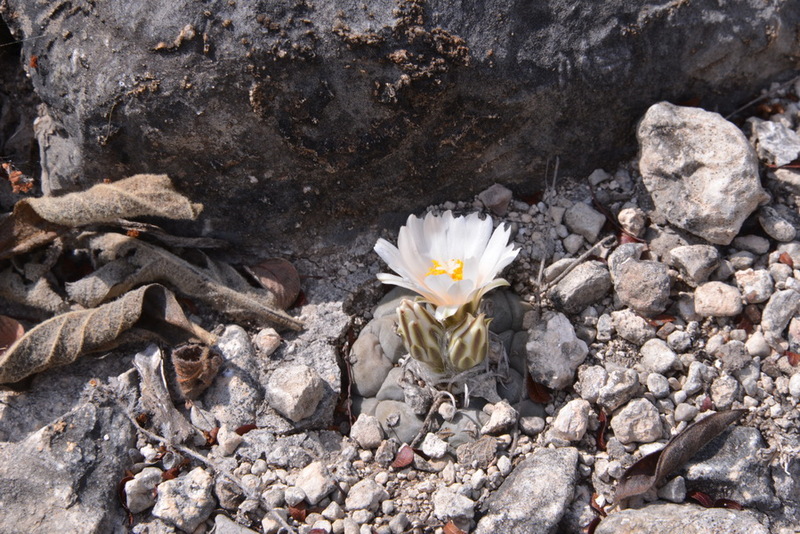 We started off with a search of Turbinicarpus rioverdensis and Thelocactus hexaedroforus. We met a very nice Mexican, Ramon, who had spent some time in Washington State and who spoke very good English. We asked permission to walk past his house and through the allotments of the small community to reach the GPS coordinates. Sure, do you want me to show you? I know where the cacti grow, he offered. So do we, thank you very much. And so we walked the supposed 300 m past his house, through the allotments and found: no cacti at all. Hmmmm. Should we go back and ask for Ramon’s help? Then Ian (again) came up trumps, thanks to a single plant in flower. Cliff and I had soon joined him. 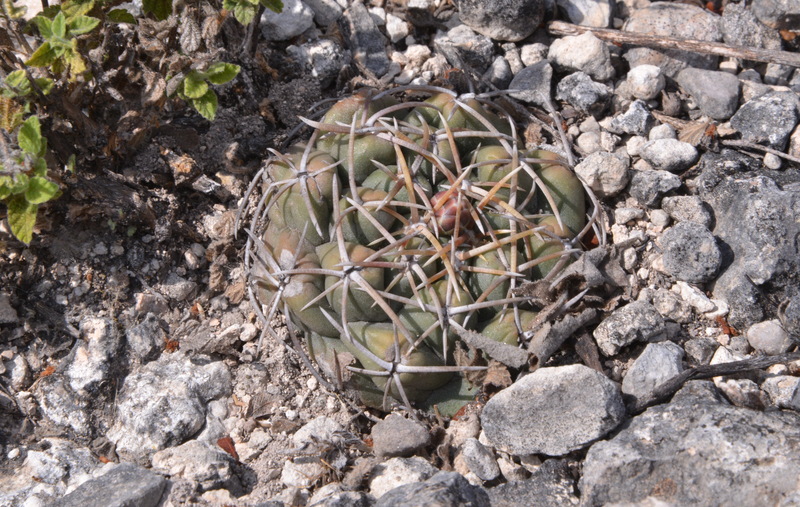 And as always, find one plant and soon you find a dozen, all in a small area. When we got back to the car we thanked Ramon and showed him the pictures. Wow! he said. These small plants grow here?! I never knew. So we saved ourselves quite a bit of time by turning down his services as a guide. 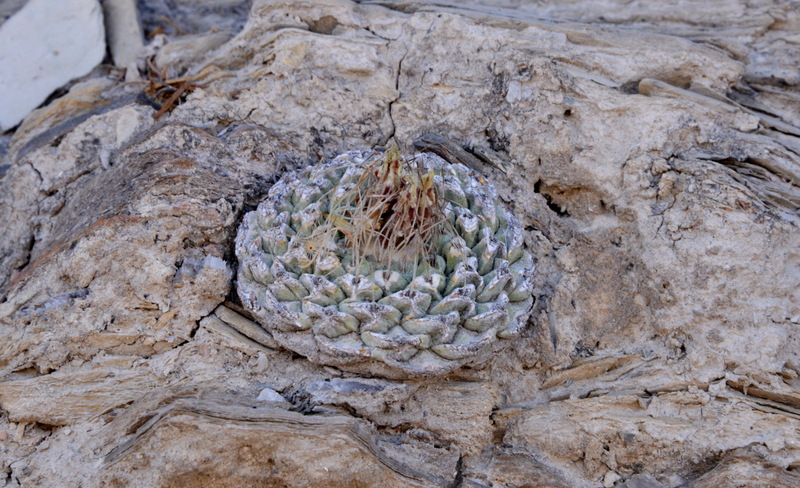 Anyway, half the fun is finding plants that play hide & seek with you, even if it seems unlikely that you will find anything in a particular spot. Another new taxon for me on my tick list! We’re in Vizarron, in the State of Quaretaro, within a day’s drive of our first night in mainland Mexico, in fact we passed by here from that first night’s hotel. Were booked in for two nights with tomorrow planned as Strombocactus Day. We cheated and actually, unexpectedly, found some on the last stop (S3129) of the day, near the town. Although the light was poor, I still managed some OK images, but we’ll go back to do it properly. Another ‘first time tick! 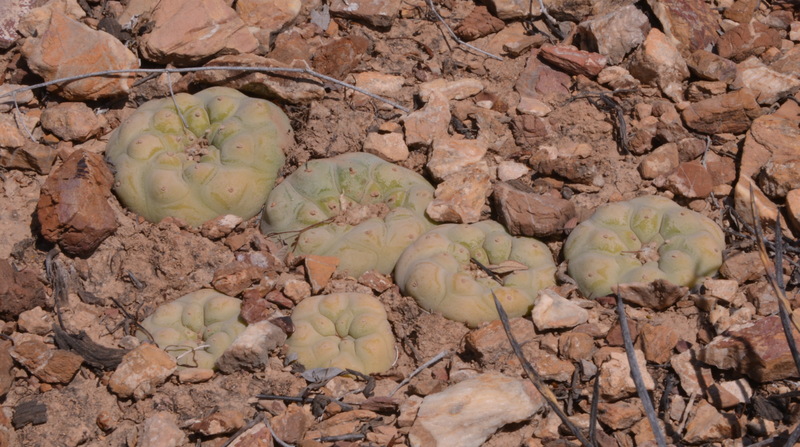 And in between, another tick, this time for Lophophora diffusa, so another great day, but getting into that ‘going home soon’ frame of mind. I bought a pair of moccasins made out of goat skin, hand crafted by a local craftsman in the high street. Should last me a lifetime, once my toe has healed.